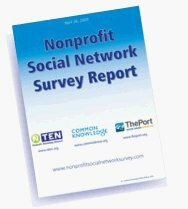 A few weeks ago, I received a link to "NonProfit Social Network Survey" – an effort focused on analyzing how nonprofits are using social media and networking tools to connect with their supporters and raise money. I was intrigued, but had a few additional questions for the researchers from that report. They kindly responded and below are their responses to my questions. The authors of the report and answers below are Aaron Biddar (referred to as "AB" below) and Jeff Patrick (referred to as "JP" below). If you have anything to do with nonprofit work, some of their insights and responses below should be illuminating. Be sure to check out the full report online as well. 1. What was the most surprising thing for you about the research? AB: That the average Facebook Cause had only generated $500.00 while house social networks have been generating $10,000 or more over the last year. JP: The very high level of commitment by nonprofits to Facebook and building their own house social networks. 75% of nonprofits have a presence on Facebook, and 1/3 are building their own house social networks. We're seeing a lot of interest, but we were surprised by how much commitment is ALREADY in place. 2. Why do you think Facebook seems to be emerging as the dominant social network for nonprofits to be on? AB: It is the first social network that has found a way to tap into the “giving” generations. Facebook is larger than and growing faster than any other social network. MySpace growth has flattened out, Facebook has picked up significantly. MySpace total audience is smaller than Facebook. Facebook continues to get incredible press worldwide – so it ends up being the most obvious choice for nonprofits. Facebook makes it easy and provides options to nonprofits to create an initial presence quickly and for free. Think, Facebook Groups, Pages and Facebook Causes (nonprofit specific application for creating a presence and fundraising). 3. Did you get any sense about whether these nonprofits were using these networks solely for community building or what percentage of them were raising real contributions? AB: Mostly built for awareness, understanding that awareness will lead to future giving. 4. What role does content creation play in how nonprofits are using social tools? Are many of them doing it, or are they just participating in social networks for conversations? AB: User Generated Content is the key to nonprofits’ success. User Generated Content is fresh, relevant content that other like-minded individuals will want to engage with on a regular basis. The icing on the cake is the removal of the burden many small and midsized NPO’s have in continually generating that content. JP: We asked about the ROLE of the social network: Marketing was the most important role (getting the word out about their organization and programs), followed by Market Research (better understanding their audience and their interests/needs), which was the second highest. Anecdotally, I don't believe nonprofits see these sites as a strictly social platform – for meeting other people. I think most nonprofits see them as socially enabled platforms for promoting or delivering their programs and mission. 5. Were there any identifiable trends in terms of types of nonprofit causes or industries that nonprofits focus in and how prevalent their use of social networks were (ie – health oriented nonprofits versus environmental nonprofits, etc.)? AB: There seems to be a good balance between health-related, environmental and religion. 6. What is one piece of actionable advice you think a nonprofit organization may be able to take from your research? AB: Get your arms around the fact that social media is here to stay. It is in its infancy but will absolutely become the core focus and hub for all marketing, fundraising and awareness efforts in the near future. JP: Your peers (other nonprofits) are creating and experimenting with social networks in many different ways, and in relatively large numbers. They are allocating small but real budgets and resources to the projects, and some (a few) nonprofits are seeing real success (ex. 600,000 person community, hundreds of thousands of money in fundraising revenue). Given this combination of evidence, it looks like the early adopters are paving the way for mainstream adoption. As a nonprofit, think about getting started – this social networking wave appears to have real potential.